One Thursday, our son Jax came home from school practically floating with excitement. Like many elementary school boys his age, he had grand dreams of becoming a cowboy—so when his teacher told the class all about life in the Wild West, his joy was through the roof. Even the idea of homework, writing a short report about Buffalo Bill, couldn’t bring him down. We had the weekend to work on Jax’s paper with him, so my husband and I suggested a trip to the Buffalo Bill Center of the West to see the Buffalo Bill Museum in Cody, Wyoming. Buffalo Bill Cody was more than just a scout, frontiersman, and showman; he was—and remains—the symbol of the Wild West. The museum celebrates his life, including a look at his Wild West Show with the world-famous Annie Oakley, and uses it as a springboard to explore the historical world of the American cowboy. Jax was instantly in awe of the museum when we got there, faced by a huge statue of Buffalo Bill himself outside the entrance to the building. But he couldn’t be stopped for too long—he knew exactly where he wanted to go for our first experience: Bill’s boyhood home, the largest artifact in the museum’s roughly 9,300-item collection. Transported to Cody, by rail in 1933, from the banks of the Mississippi River at LeClaire, Iowa, the yellow two-story house is made from sawn lumber and has two rooms on each floor. It’s not only the biggest item in the museum, but also the oldest building in Cody and possibly the state. We stepped inside the entry, peered beyond the railing into the rooms on the ground floor, and couldn’t imagine a family of seven living in the tiny home! “What do you think, Jax?” I asked him as he proudly posed for a picture in the doorway of the house. I laughed and we continued on, touring through the intricacies of Buffalo Bill’s childhood and life. The gun collection was particularly exciting. The museum has more than three dozen of Cody’s firearms, including the U.S. Springfield Model 1866 .50-caliber trap-door type rifle he used for bison hunting in the 1860s and 1870s, which earned him the nickname “Buffalo Bill.” We saw the chuck wagon from his ranch (outside of Cody). His custom-built Wild West saddle. Branding irons. Furniture. Artifacts from his home and gifts from world leaders. It was easy to feel immersed in the life of Buffalo Bill Cody—able to place ourselves back into the late-1800s world of roping and riding through the extensive collection we browsed. As adults, we appreciated the interactivity of the artifacts in the museum. We were able to learn much more than would fit on a placard by simply scanning a QR code at exhibits, which whisked us away to an entire online world of Buffalo Bill information. We could also continue our learning experience once we got home—a great resource for us and also for our young (and sometimes forgetful) son, who might need some additional help with his report. The museum’s website comes complete with a fully interactive online experience that carries the user through the stages of Bill’s life, from his childhood to his time with the Pony Express and the Army, to his later years on the road touring, and at home with his wife and children. 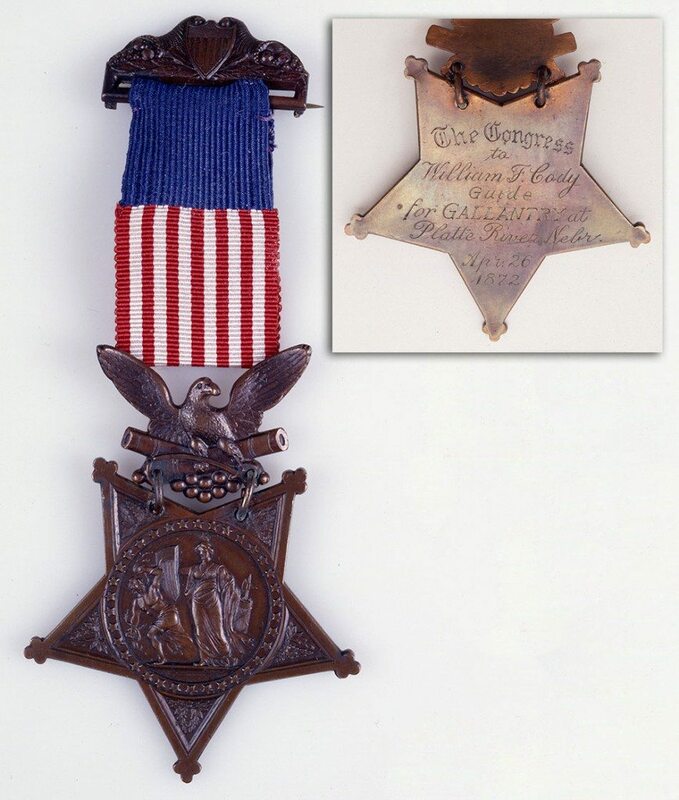 Perhaps the most surprising item we saw in the museum was Bill’s Congressional Medal of Honor. We all knew he had been a scout in the Army during the Indian Wars, but none of us realized he had earned this high honor. The story behind the medal is equally fascinating—Congress revoked it in 1917 when legislators retroactively created stricter rules for recipients. Then, the government reinstated the medal in 1989 when they recognized Bill again for the deserving work he did. For the last part of our museum trip, we explored Buffalo Bill’s Wild West show memorabilia. Jax’s teacher had shown the class several videos of the spectacle, and now he stood in awe at the humongous—and original—wall-sized billboard poster of Bill meeting Queen Victoria, who attended one of his shows in 1887. 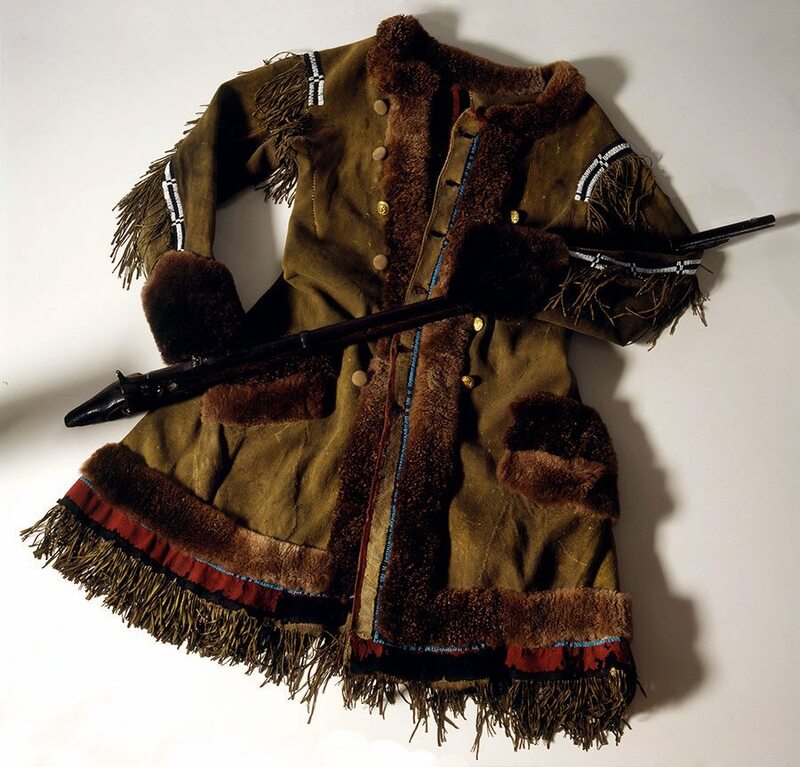 Jax’s favorite part was seeing all the costumes and clothes worn for the shows by Buffalo Bill, Annie Oakley, Johnny Baker, and other performers. “Do you think that would fit me?” asked Jax, pointing at a jacket. He was hoping to become the next Buffalo Bill, I think. “I don’t know, buddy. I think you’d have to be a little taller!” I replied with a smile. Jax had hoped for another answer, but his enthusiasm was undiminished. After seeing the stagecoaches, instruments, props, and guns—Jax was ready to start his own version of the show. As soon as we got home, Jax excitedly began working on his paper, eager to share everything he learned at the Buffalo Bill Museum with his classmates. The collection of artifacts, and the fascinating man they represent, inspired all of us. Buffalo Bill Cody wasn’t just a shoot-’em-up cowboy; he was a complex man of the West whose life was far richer than most people know—a true Man of the World. Explore the online collection and plan a getaway to Buffalo Bill Center of the West.